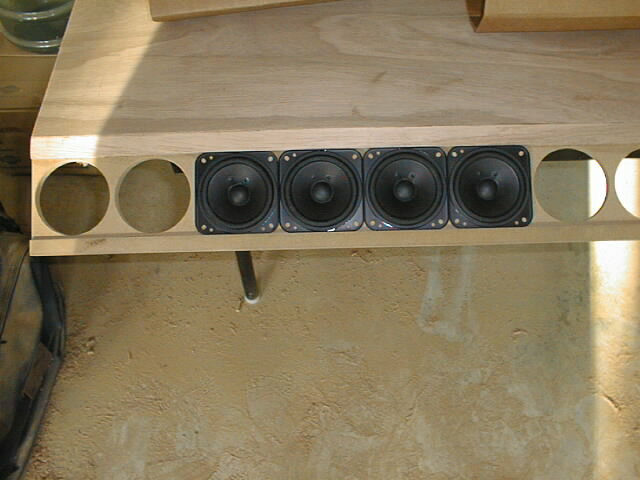 I built these speakers in early 2000. The article below was written in March of that year while I was still in the design phase, and reflects the knowledge of line sources available at the time. Since then many more people have built line sources and there is lot of information available from websites like diyaudio.com. Many years ago I went to the Stereophile magazine show in San Francisco with my father. 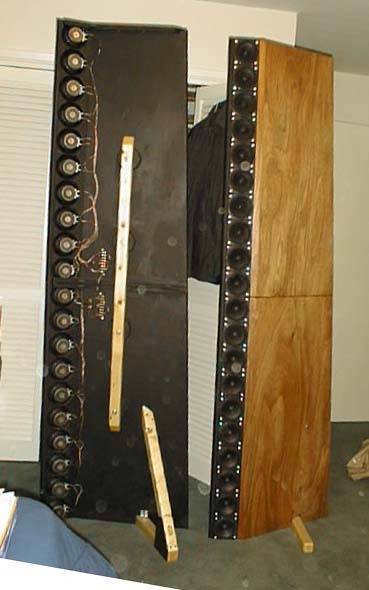 In one room a company was demonstrating its “Concert Grand” speakers andI remember being amazed by their scale (they were 1” shorter than the ceiling). Their price tag of $100,000 was just as impressive. Since that time I have run across magazine ads for huge tower systems, but I never knew the theory behind the design until the bass list began discussing line source speakers in early 2000. I was extremely interested in the idea of a line source emitter, but the cost of the large scale ribbons on the market (such as the BG) was prohibitive, especially given the face that I was working on my Egg Monitor 1’s at the time. Some other people on the bass list bought large numbers of small, inexpensive drivers to experiment with line source arrays. In theory, as the size of the drivers approaches zero, and the number of drivers approaches infinity, the line array will functionally resemble a perfect line source. Of course you cannot have an infinite number of infinitely small drivers, instead multiple point sources can be combined to emulate a line source. At the acoustic crossover points between adjacent drivers additive interference will occur which creates “bumps” in the line source radiation (aka comb filtering). To minimize these “bumps” small, closely spaced drivers should be used. When Parts Express offered 4” full-range drivers for $1.50 each, I decided “what the hell” and bought 50 of them. 24 drivers, placed edge-to-edge, will be used on each speaker for a height of slightly over 8’. The remaining two drivers will be sacrificed during the driver testing phase. I do not plan to reiterate large amounts of information about the theory behind dipoles and line sources; there are much better resources on the web for that information. Instead I will relate the basic theories (as I understand them) and how they affected my design decisions. “True line sources.” A true line source emits sound from all points on a line constrained by two planes. In other words, the speaker should reach from the floor to the ceiling in a normal size room, or well above the listeners head in a room with greater than 8’ ceilings. Response from 200-18,000 Hz. Since the fs of the drivers is 118 Hz, and to keep baffle size to a minimum, the lower cutoff of the speakers should be around 200 Hz. Parts Express rates the speaker up to 16,000 Hz, I believe that by playing with the baffle step response can be extended to at least 18,000 Hz. Adjustable height. These speakers should be able to fit in a room with a standard (8’) ceiling. To make them portable they should break down into pieces less than 4’ tall. Total budget = $200. Seeing as my last project went 50% over budget, I don’t know how reasonable this is. But, I am going to try. 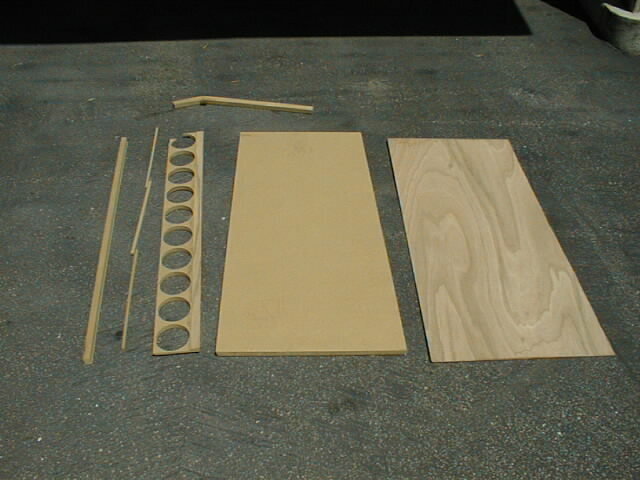 Working prototype by mid-April 2000. My college’s open house is in mid April, and the Audio Engineering Society would like to display the DLSA’s in their booth. Not too ugly. Since these 8’ behemoths are going to have to reside in my living room, they have to be relatively un-intrusive. This means that they must have an attractive finish, and not be too wide. There were no specific power handling, efficiency, or weight requirements. As of 3/30/00 I haven’t yet been able to measure the driver’s frequency response. It may be necessary to apply a damping compound to the cone to smooth the frequency response. The driver dimensions given by Parts Express seem to be a little off. I will measure the drivers to get more accurate data. A possible problem arises because the drivers have a ¼” tall lip around the edge. This lip will cause edge reflections. I am still considering ways to combat this problem, I might place a piece of ¼” felt around the cone, or I might build up a “ramp” next to the lip with modeling clay. There has been a lot of experimentation done regarding baffles for the BG ribbons (see Resources). In particular the experiments done (can't remember name) and Rudi contain an enormous amount of information about baffle design. Their ultimate finding was that a one-sided “air foil” type baffle provides the best frequency response. Originally I was going to build a curved baffle, but given time, budget, and patience constraints I gave up on that idea. I was considering building the curved baffle using one of two methods. The first was to build the baffle out of two joined pieces of ¾” mdf giving a total baffle width of 1.5”. 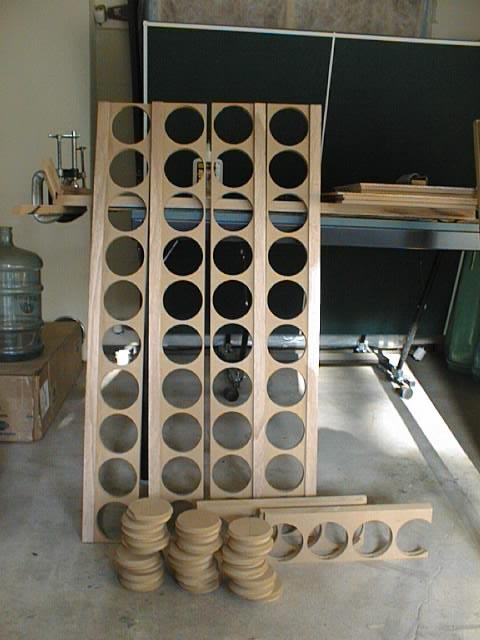 The baffle could then be machined using either a CNC machine or a home-brew router guide I have been thinking of. The second method was to laminate 4 sheets of 1/8” luan together to build up a ½” thick baffle with the appropriate curve. Unfortunately the first method requires too much time, and the second time costs too much (it would require a large amount of luan). If my initial design works out, I may go back and build a more complex baffle. So, I have decided to use a “flat” baffle. All of the 4” drivers will be mounted on a 5” wide piece of ¾” mdf. I will refer to this unit as the driver array. The extra ½” on each side will be used for mounting purposes. I do not want to recess all 48 drivers, so instead I plan to put a ½” wide strip of ¼” luan on both edges of the driver array. This will bring the baffle flush with the top of the driver flange, and it will make the total baffle width 1”. On the interior side of the driver array I plan to mount a 1” x ¾” piece of mdf that is machined with a ½” quarter round on two edges, yielding a 1” half round. This will help ease transition of the sound from half space to full space, reducing edge diffraction. The total baffle width (from the center of the driver) on the interior side will be 3 ¼” which corresponds to a baffle reinforcement frequency of ~4150 Hz. On the exterior side of the driver array I plan to mount a trapezoid with an average baffle reinforcement frequency of 200 Hz. At the edge of this trapezoid will be a 1” half round, similar to the one on the interior side of the baffle. The reason a trapezoid is used is because baffle enforcement occurs at different frequencies all along the edge of the trapezoid, higher frequencies at the top and lower frequencies at the bottom. There is no sudden baffle step at a given frequency. The ¼ wavelength of 200 Hz is 16.95”. Based on this calculation, the average exterior baffle width should be 17”. The difficulty is that wavelength and frequency are non-linearly, inversely related. This means that a simple average of the top and bottom widths of the trapezoid cannot be used.